Barton Glass choose ASP Microcomputers to deliver an innovative real time web based barcode tracking solution with integration into their ERP system. Barton Glass was founded in Victoria, Australia in 1999 and provides glass products and services to the construction and building industries nationwide. Now Barton Glass are one of the major glass product suppliers, and manufacture a comprehensive range of glass products, from float toughened safety glass, high performance and energy efficient glass and custom made laminated glass, to suit the diverse needs of the market. Barton Glass has made their reputation by offering commitment to customer service including fast order handling and efficient delivery services. Barton Glass provides the highest level of products and services to their clients as well as complying with stringent Australian standards. Fast order processing and delivery have been vitally important for Barton Glass and a barcode system was introduced for handling materials, products in process, finished products and delivery service. Barcodes are attached to panels of glass products to identify each order. There was no correlation between the purchase order and trolley which carries both glass in process and finished goods but now scanning a barcode takes place at each process. Versatile solution for production, inventory and Goods in/out operations. Ultra rugged hardware design with three metre drop and dust and water resistance compliant to IP67 standards, suited for the conditions. Ergonomic hardware with human centred design for all day scanning. Quick and reliable scanning performance to read barcode label even through five panes of glass. By using the Casio DT-X200 with the web based software, Barton Glass eliminated late deliveries and dramatically reduced waste materials. QR Codes are becoming commonplace as a tool for marketing, lean manufacturing processes and even replacing RFID applications due to the large amount of data [more than 5000 characters] which can be stored in a QR code. The QR code can also be used where there are space restrictions such as in an envelope window and can be printed as small as 3 sq mm. QR Codes have been used in such applications since the early 1990’s. ASP has taken all the benefits of QR Code and developed a very innovative solution to assist organisations such as vehicle manufacturers to automate the process of managing Recall letters. As part of the regulatory process for Recalls, vehicle manufacturers must send their customers a letter outlining the details of the Recall. They also have to note any change in ownership details for these vehicles as well as track “return-to-sender” letters for their audit compliance purposes. The complete process for just one vehicle can take more than two minutes and as there are usually thousands if not tens of thousands of Recall letters, this can amount to a lot of administration time and potential errors. ASP’s solution can reduce the time from minutes to only a few seconds by scanning a QR code in the window of the envelope and therefore not needing to even open the return to sender envelope. The solution communicates with the backend system and eliminates input errors caused by manual data entry. 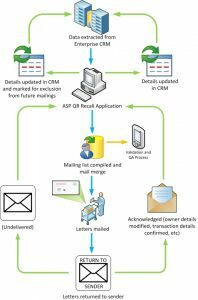 The master data is normally kept in a backend database such as SAP, Oracle, etc and for each recall campaign, a CSV file is usually generated containing all the pertinent details such as VIN number, Customer name and address, Registration number, etc. The letters are mail merged and printed for mail out. The information from the inbound letters are updated into the backend database usually via a CSV import file. The Multiple Claims letters have the data amendments recorded in a CSV format again and uploaded to the backend database. 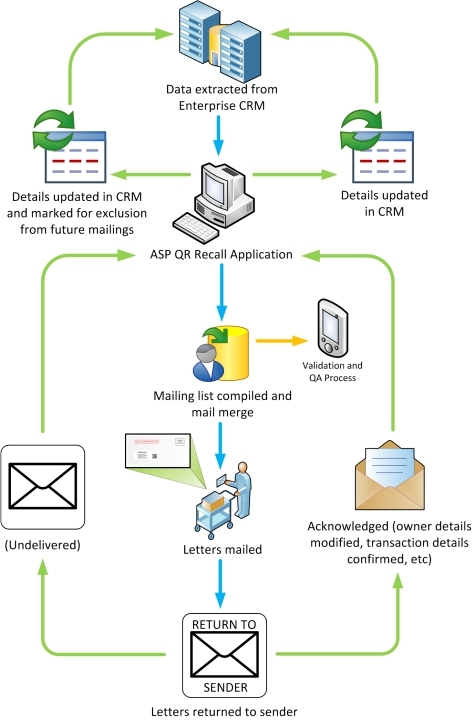 The complete ASP QR Recall Application workflow can be seen in the diagram below. A seven storey building in the heart of Melbourne was the location of the Australian Bureau of Statistics Data Processing Centre (DPC) for the 2006 census. In 2011 the DPC is in the old Age building on Spencer Street in Melbourne. The task of tracking the millions of forms in the DPC for the 2011 census is again going to be deployed by ASP Microcomputers custom built solution Around 40,000 census officers are appointed to distribute and collect the forms to every household in Australia, and each is allocated a Collection District (CD). The eighteen pages which make up the census form are collected and sent back to the DPC in Melbourne for processing. Over 800 people are employed to manage and process the more than nine million completed census forms that are returned to the DPC. That’s where ASP’s solution starts. Design an effective and secure real time census form tracking and reporting system for implementation at the Data Processing Centre in Melbourne. Barwon Health partners with ASP Microcomputers and Maxus to deliver an around-the-clock RFID book lending service to patrons. Barwon Health is Victoria’s largest regional health service providing care to more than 450,000 people in Geelong and South Western Victoria. Barwon Health employs over 5,000 staff and has an annual operating budget in excess of $330 million. Barwon Health incorporates a major teaching hospital, associated with Deakin and Melbourne Universities, a major aged care and rehabilitation facility, a mental health service and community health centres. Library Service supports three main activities within Barwon Health, specifically clinical care, medical research and education. The library resources comprise a lending collection of 7000 books and a serials collection of 1500 titles. ASP Microcomputers and Signature Software team up to deliver an intuitive stocktake solution for Telstra Retail Stores. There are almost 200 Telstra Licensed Stores and Telstra Dealers Australia wide. These businesses sell mobile communication devices and service contracts under the Telstra brand name. In addition they sell home and consumer products for the fixed and data networks. Stocktakes are usually conducted monthly, and need to be done quickly and without errors. Users need to count serialised and non-serialised inventory, as well as having a visual reference between the stock scanned and its corresponding description in the PC program. Signature Software is an Australian-based company with over ten years experience in the support and development of business application software. Signature’s flagship product, the ICE Business System, has been developed specifically for use in the office equipment, telephone systems and mobile phone industries. Develop a reliable and simple to use portable stocktake solution which integrates to the inventory management area of the ICE business system. The Institute offers a broad spectrum of educational courses, mostly at the post-secondary level, to over 50,000 students. The Information Commons is a library network of some 130,000 items into which is integrated a computer-based learning area in each of its four branches. Stocktake is an important process, to know what materials are missing and need urgent replacement, and to gauge how well the material security system is operating. It is a labour-intensive operation that is difficult to carry out quickly and safely. 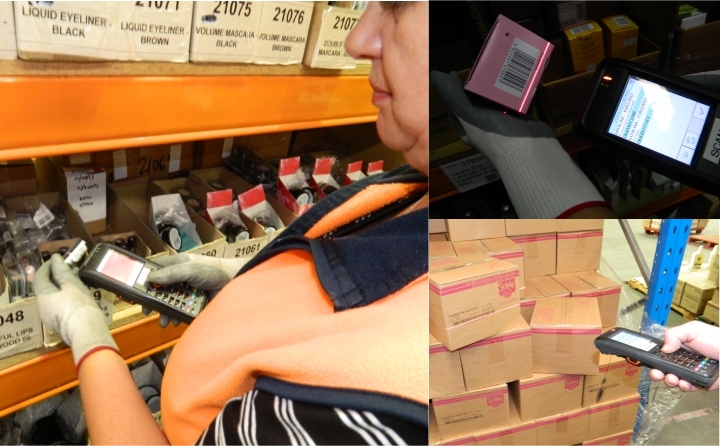 The solution was to replace the corded equipment with small, portable cordless devices, taking advantage of Holmesglen’s wireless computer network and Bluetooth® wireless barcode scanning technology. To implement a safer and faster way of taking stock of materials in the Information Commons, and improve processes so that it’s not necessary to close the library to the public during stocktake.